On July 14, 2015, the day when several world powers struck the Iran nuclear deal, then-President Barack Obama triumphantly touted his administration's crowning foreign policy achievement. "Every pathway to a nuclear weapon is cut off," he said. "Because of this deal, Iran will not produce the highly enriched uranium and weapons-grade plutonium that form the raw materials necessary for a nuclear bomb." Ali Akbar Salehi, the head of the Atomic Energy Organization of Iran, apparently did not get the memo. Speaking to Iran's Channel 4 on Tuesday, Salehi made several revealing comments that belie Obama's maximalist statements about the nuclear deal—officially called the Joint Comprehensive Plan of Action, or JCPOA. His remarks, translated by the Middle East Media Research Institute, should concern anyone worried about a murderous Islamist theocracy obtaining the world's most destructive weapons. "Iran has lost nothing as a result of signing the agreement, and history will prove this," Salehi said. "We have preserved our capabilities in the field of enrichment. We are providing products for other industries and are continuing to manufacture new centrifuges. We are doing everything we need to do." Salehi described how the Iranian regime circumvented a section of the deal that explicitly requires Tehran to remove the reactor core at its Arak nuclear facility in central Iran, and then to fill its tubes with cement so the facility cannot be used to pursue a plutonium path to a bomb. Iran's nuclear chief explained that Tehran secretly acquired and stored replacement tubes, noting that only Iran's supreme leader, Ayatollah Ali Khamenei, knew about the decision. "When our team was in the midst of the negotiations, we knew that [the Westerners] would ultimately renege on their promises. The leader warned us that they were violators of agreements," Salehi said. "We had to act wisely. Not only did we avoid destroying the bridges that we had built, but we also built new bridges that would enable us to go back faster if needed." Salehi added that images showing the reactor core filled with cement were "photoshopped." He then said that Iran does not "intend to build a nuclear weapon" and that the reactor at Arak is "not suitable for nuclear weapons"—similar to past statements from Iranian officials now proven to be blatant lies. Yet Salehi went on to detail a host of ambitious plans for Iran's nuclear program, such as transferring 30 tons of yellowcake, uranium concentrate used to produce nuclear fuel, from newly operational production facilities in Ardakan to Isfahan. This step would be key for ensuring the availability of raw material if Iran opts to leave the JCPOA and increase its uranium enrichment. 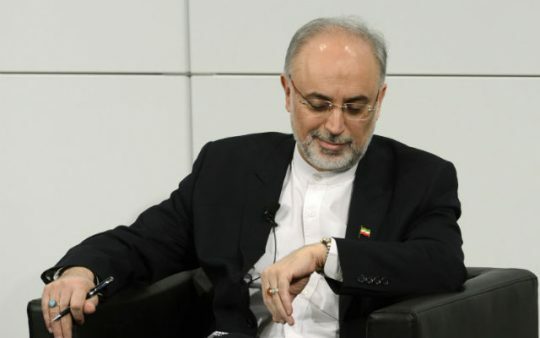 Salehi also mentioned that Iran has been authorized to produce additional advanced centrifuges, which make enriching uranium far more efficient; has "advanced significantly in the field of nuclear propulsion"; will continue to "discover and mine" uranium; and will construct new nuclear power reactors as planned. According to Michael Segall, an expert at the Jerusalem Center for Public Affairs, Salehi also said that, "as one who is responsible for all technical aspects [of Iran's nuclear program]," he was "thankful to Allah for the way in which the discussions relating to the technical aspects of the nuclear talks were conducted, as they left so many breaches in the agreement that Iran was able to exploit, doing things that the other side could not claim were a violation of the nuclear agreement." Salehi is likely making such boastful comments for two reasons: to increase Iran's pressure on the Europeans, and to respond to conservatives inside Iran, who have pilloried the government for remaining in the nuclear deal. Tehran has grown increasingly frustrated with the Europeans for not taking more assertive action to circumvent American sanctions and conduct robust business with the Islamic Republic. Expect Iranian officials to continue to tout the progress of their nuclear program and hint at leaving the JCPOA to push the Europeans. Furthermore, members of Iran's government who support the deal want to boast about the nuclear program's strength to undercut more conservative voices within the regime who want Iran to rip up the deal now. Regardless of the motive, Salehi's comments are the latest evidence that Iran completely outmaneuvered the Obama administration while negotiating the deal. Tehran wanted it all—to obtain relief from sanctions while preserving the ability to build a nuclear weapon in the future. Since the deal was reached, it has become increasingly clear that the Islamic Republic achieved its goals. The nuclear deal is more than "defective," as President Trump has described it. The agreement is rotten to the core, built on a mountain of lies. This entry was posted in National Security and tagged Iran, Iran Nuclear Deal, Nuclear Iran, Nuclear Weapons. Bookmark the permalink.